Water-efficient plants. Click to enlarge. Most of the water used at home is used outdoors, so even small steps to save water can yield big savings. Little things like fixing a broken sprinkler or making sure that you are running them in the cool of the early morning rather than the afternoon can save lots of water. You can conserve even more by shrinking the amount of lawn you have, planting water-efficient plants, installing a drip irrigation system or adding a weather-based smart controller. Saving water is not hard. We simply need to be smart about using what we have. Low water use landscapes can be beautiful while using minimal amounts of water. Prioritize your plants Determine which plants are most susceptible to water stress. High on the list should be plants that are valuable in terms of replacement cost, prominence in the landscape and enjoyment. High Priority - trees and shrubs (especially those that are young and planted in an exposed site). Large, mature shade trees and shrubs can be left alone unless the drought is severe and the trees begin to wilt, or the root systems have been recently disturbed. Medium to High Priority - perennials, fruit and nut trees, small fruits and vegetables; turf that is less than one year old. Low Priority - annual flowers and herbs, ornamental grasses, established turf. These are usually less expensive and more easily replaced. Irrigate early Less water loss occurs from evaporation and wind drift in the early morning hours because temperatures are cooler and there is less wind early in the day. Know your soil The type of soil in your landscape largely determines how often you should water. Clay soils hold more water than sandier ones they can go longer between waterings than sandy soils. Mulch Apply 2 to 4 inches of mulch around plants to keep weeds down, conserve soil moisture and moderate soil temperatures. Mulching minimizes water evaporation from the soil surface, reducing the need to irrigate. Keep mulch 3 to 4 inches away from the trunk or stem of the plant to prevent rot. Control weeds Weeds can out-compete cultivated garden plants for water and nutrients. Add organic matter When possible, add organic matter (compost) to your soil. This will improve the water-holding capacity during dry weather and promote good drainage during wet weather. Don't fertilize Or if you do, apply a low-nitrogen fertilizer. Fertilizing stimulates growth which increases water needs. Avoid runoff and puddling by cycling irrigations. Let sprinklers run for 10 minutes then shut them off for 10 minutes, allowing the ground to absorb the water. Use a broom to clean driveways, sidewalks and steps. Using a hose to clean can waste hundreds of gallons of water. Select water-efficient plants When buying new plants, use some of the resources below to choose low water users adapted to our climate. Keep in mind that all plants require regular watering to become established, including California natives. The resources below provide more information about how to create a water-efficient landscape and how to deal with drought conditions in your garden. Sustainable Landscaping in California (PDF) is a 21 page, UC ANR publication that describes steps to take to beautify your home landscape while conserving resources; it also includes information about using graywater. Information from the UC Center for Landscape & Urban Horticulture about landscape water management includes questions and answers regarding water conservation and dealing with drought in the landscape. Water Conservation Tips for the Home Lawn and Garden (PDF 93kb) is a UC ANR publication that describes how to reduce water use and at the same time have a lovely and enjoyable garden. This chapter from the California Master Gardener Handbook discusses how to keep various plantings alive (PDF 93kb) under drought conditions or water restrictions. Healthy soil builds healthy plants and saves water too. Watch a video about building healthy soil. UC Davis Arboretum staff suggest actions to take for landscape survival during drought. UC environmental horticulturists offer tips on how to save water in the garden (PDF 11kb) and landscape. Watering tips for drought conditions (PDF 247kb) from the University of Maryland offers suggestions for prioritizing the water needs of typical landscape plants, as well as watering and cultural tips for dealing with drought. This Colorado State University information about landscape management during drought (PDF 19kb) also applies to our California drought conditions. The Sacramento Tree Foundation offers tips on drought care for trees, as well as specifics on caring for mature trees and caring for young trees during a drought. Also see their website in the helpful sites listed below. Rules of Thumb for Water-Wise Gardening (PDF) is a booklet produced by Regional Water Authority that offers suggestions for planning, planting and maintaining a water-efficient landscape. Water-Smart Landscapes (PDF) from the US EPA describes how to have a beautiful, healthy yard while using less water. A seven-page document, the WEL garden plant list (PDF 106kb), lists the plants growing in the Water-Efficient Landscape demonstration garden areas at the Fair Oaks Horticulture Center. This is a list of the California native plants (PDF 120kb) growing in the Water-Efficient Landscape at the Fair Oaks Horticulture Center. With minimal supplemental water these plants can be kept attractive all year. The Arboretum All-Stars are 100 easy to grow, water-efficient plants selected by the UC Davis Arboretum horticultural staff and tested in our region. UC Davis horticulturists have been evaluating landscape plants with the potential to be good performers in low-water use gardens since 2005. See the results of these landscape plant irrigation field trials. Suggestions for home vegetable garden management (PDF 20kb) during a drought include valuable information on critical watering periods for numerous vegetable crops. Some vegetables require less water (PDF 8kb) than others; this article describes which ones to consider for your vegetable garden when water use is limited. Here is valuable information from ReLeaf California that tells how to save our water and our trees. The Sacramento Tree Foundation offers tips on drought care for trees as well as specific information about caring for mature trees and caring for young trees during a drought. Also see their website in the helpful sites listed below. The UC Drought Management website is written for commercial growers, but the information on drought strategies for peaches, plums and nectarines is valuable for trees in home orchards as well. Lawn Removal Methods will help you go beyond lawn to a more water-efficient garden. This guide to irrigating established lawns from UC IPM Online describes how, when, and how often to water your turfgrass. Lawn watering quick tips from UC IPM Online, the UC Statewide Integrated Pest Management Program. Managing Turfgrasses During Drought (PDF 421kb) is a comprehensive and detailed UC publication that addresses situations such as the ones we are currently facing. Getting it Right! Drip Irrigation, Plant Selection, and Lowering Water Use. See the link above for handouts and more information. This workshop was presented October 4, 2016 in Fair Oaks by UC Cooperative Extension and the California Center for Urban Horticulture. Plan your irrigation system from UC IPM Online describes things consider when planning a watering scheme. UC Guide to Healthy Lawns provides extensive information about growing a healthy lawn. From UC IPM Online, the UC Statewide Integrated Pest Management Program. The Sacramento Tree Foundation offers excellent in-depth tree planting and watering guidance for our area. River-Friendly Landscaping is an environmentally friendly way of gardening. RFL practices conserve water, reduce yard waste, and prevent pollution of air and local rivers. Use the River Friendly benefits calculator to see how much water, time and money can be saved by creating a river-friendly landscape. Water-Wise Gardening in the Gold Country Region from the Regional Water Authority offers extensive information about garden design, plant selection, watering tips, and tours of gardens in the Sacramento area, including the Water-Efficient Landscape gardens at the Fair Oaks Horticulture Center. Regional Water Authority provides comprehensive advice about water smart gardening. Find your water provider by locating your property on their map, or simply enter your address and zip code. New California Landscape is EcoLandscape California's eco-friendly landscape design plans. 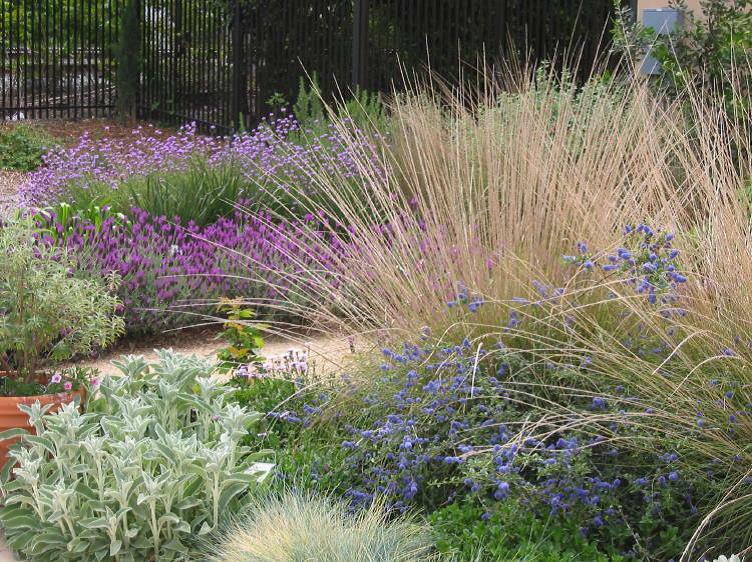 Downloadable landscape and irrigation plans and documents are included, as are suggestions for plants that are low water users and climate-appropriate. In-depth plant profiles and photographs show how each plant looks during all four seasons. WUCOLS IV (Water Use Classification of Landscape Species, 4th Edition) provides guidance in the selection and care of landscape plants relative to their water needs. Search for different types of plants appropriate for your specific region of California. California Drought is the State of California's website with the latest news about the dry conditions in our state, plus links to statewide drought resources.